An emblem of modern architecture when it opened in the 1940s, New York’s John F. Kennedy International Airport, will soon undergo a historic $13 billion overhaul. John F. Kennedy International Airport — commonly known as “JFK”— was built in the 1940s as only a supplement to LaGuardia Airport. When it opened in 1948, it was known as New York International Airport, Anderson Field, or more simply Idlewild (in honor of the resort and later golf course that was demolished to make way for the runways and terminals). The airport was renamed in honor of President Kennedy in December of 1963, about a month after he was assassinated. And the adjunct airport quickly surpassed LaGuardia Airport in capacity. JFK Airport is located in Queens, New York City, and it’s so large it doesn’t even require a unique address. Instead, the JFK airport address is distinguished only by its own zip code: Jamaica, New York, 11430. 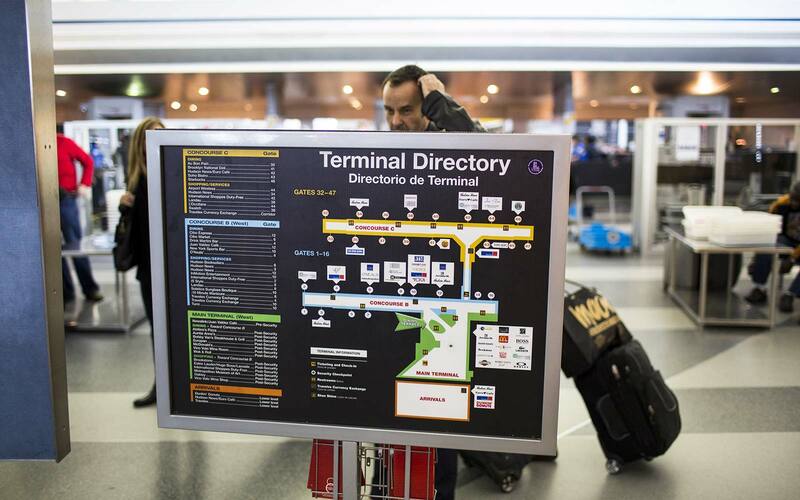 Take a look at the JFK Airport map to see just how big the airport is. 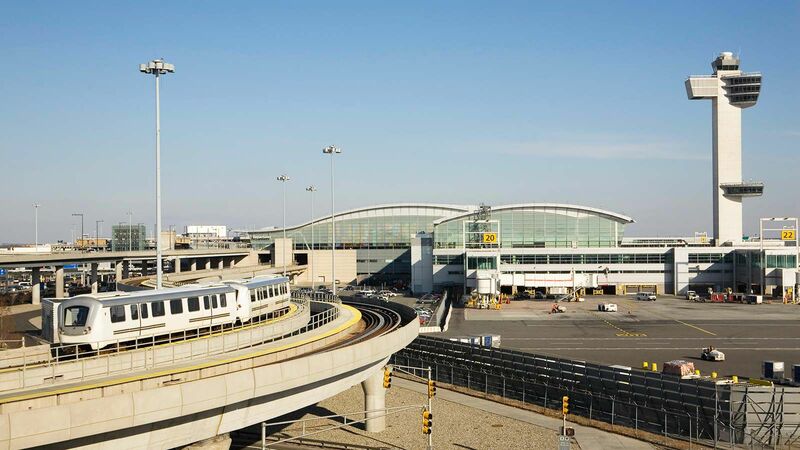 Travelers will find JFK to be well-connected to Manhattan by an AirTrain system that links with the subway. Buses and an official van services also bring travelers from JFK to Manhattan, and vice versa. As part of its upcoming redevelopment plans, the airport will soon see the addition of two new world-class international terminal complexes on its north and south sides, in addition to the demolishment of older terminals and the utilization of vacant space to introduce an increasing number of gates and ultimately allow for at least 15 million more passengers per year. Because there are so many travelers passing through New York City’s busiest transportation hub, it can be difficult to navigate the sprawling 4,930-acre complex. 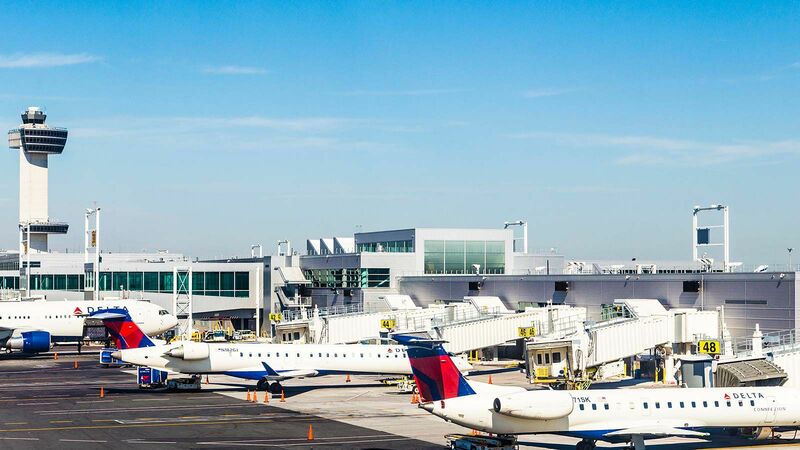 Whether you’re rushing through to make a connecting flight or killing time before your departure, this comprehensive guide to JFK’s terminals, JFK Airport parking, and more, will help you make the most of your time at the airport. The Terminal One Group (a consortium of four airlines that include Lufthansa, Air France, Japan Airlines, and Korean Air Lines) will be building a new $7 billion and 2.9 million-square-foot terminal on the airport’s south side. 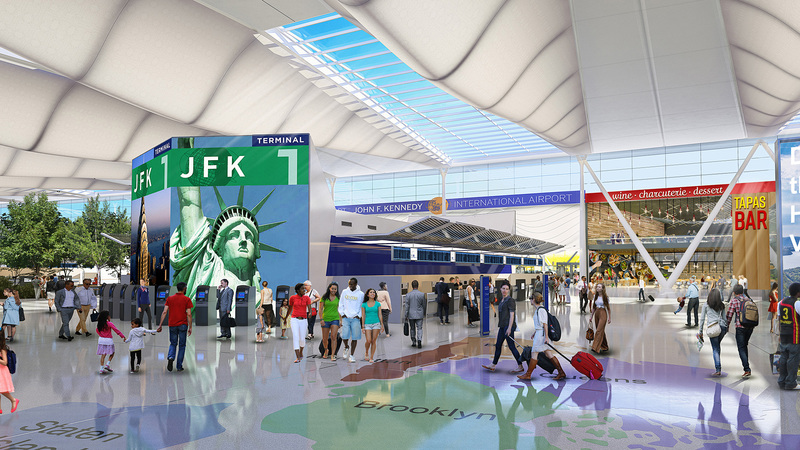 A rendering of the new Terminal 1 coming to JFK. 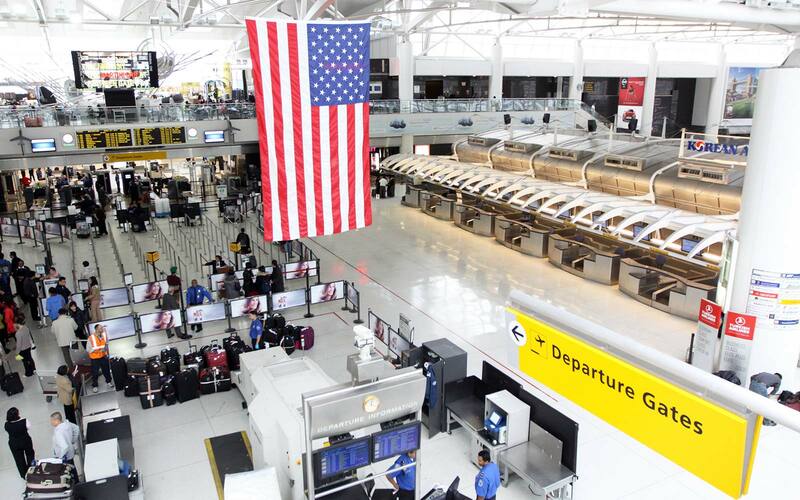 The terminal, which will be complete by the end of 2025, will replace JFK’s Terminal 1 and Terminal 2 and expand into the now vacant Terminal 3. 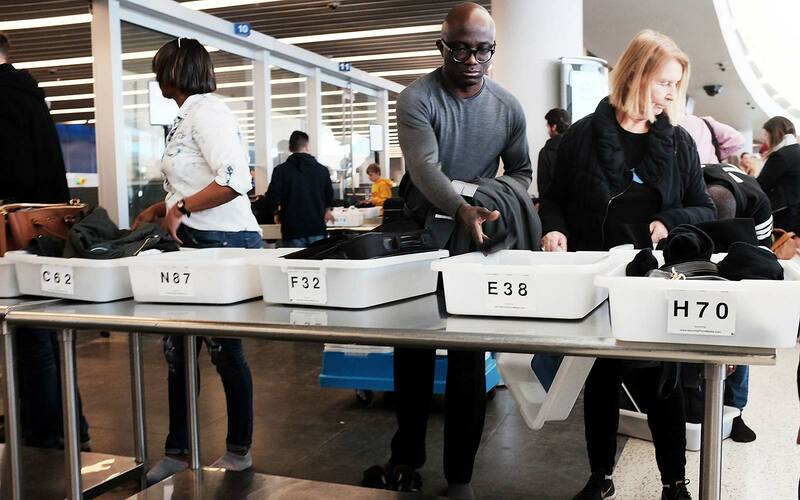 The terminal, which will include 23 international gates, at least 24 security screening lanes, and 55,000 square feet of green space, will also connect to the existing Terminal 4. 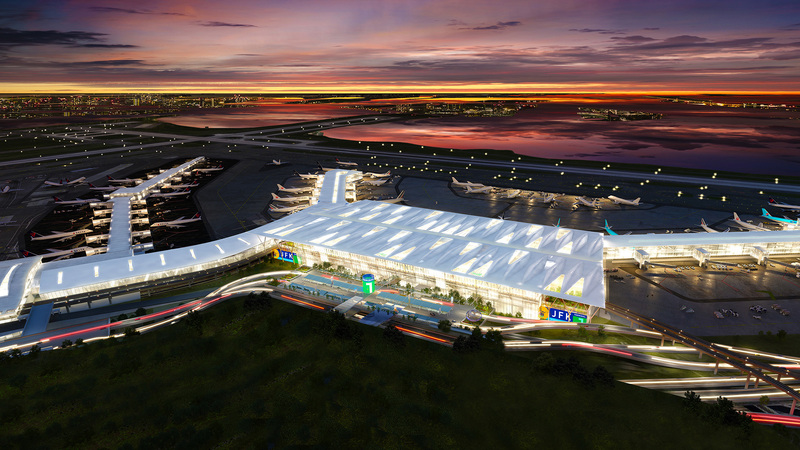 A rendering of the upcoming Terminal 1. 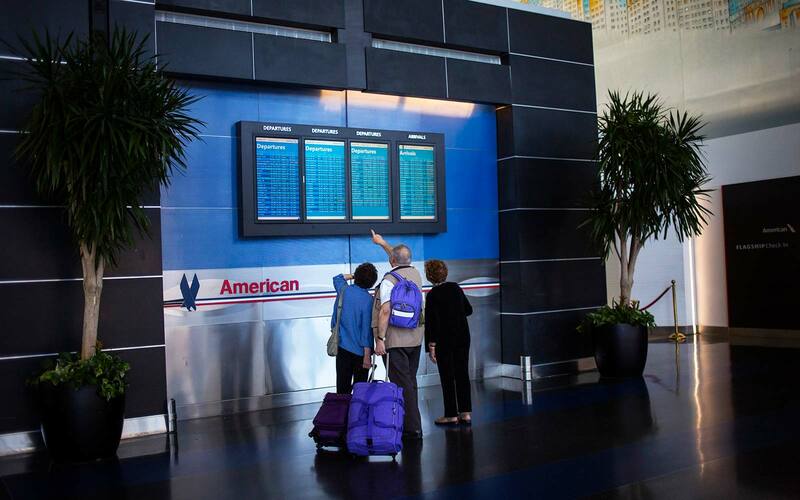 Most of the current offerings will remain as they exist today across the terminals for the next few years, with the first 11 gates of the new terminal set to open in 2023. Currently, the terminal is a four-story building with 11 gates. Its levels include Arrivals, a Mezzanine, Departures, and the Concourse level, where travelers pass through the security checkpoint and ultimately board. Terminal 1 has a modest mix of dining options, most of which are fast casual and chains. Food Options: Several of the dining concepts in Terminal 1 are being refreshed, with some stops still in the process of opening. For pizza, meatballs, or salads, stop into PZA, while Wok and Roll offers steam-table Chinese fare to take on the go. 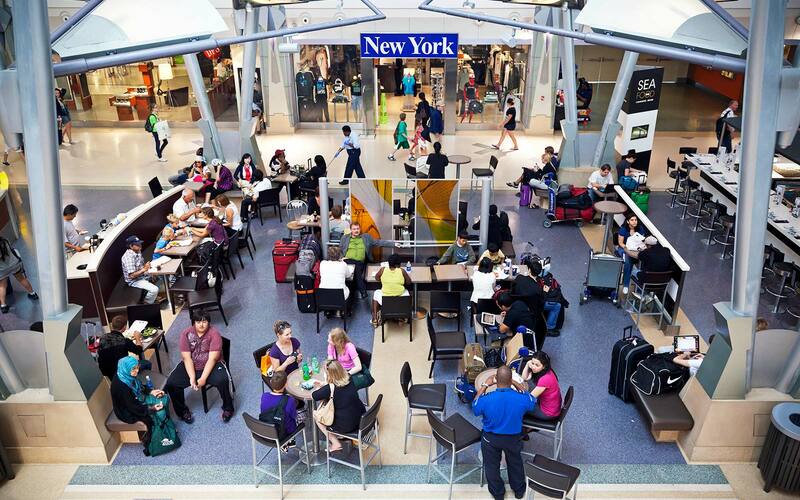 Coffee Shops: For a caffeine boost in Terminal 1, there is a Starbucks, Dunkin’ Donuts, and a Euro Café. Bars: Martini Bar serves arguably the best cocktails in the terminal. Travelers will find Terminal 1 filled with all the standard airport retail options: a handful of Hudson News outposts, a New York Gifts for kitschy Big Apple souvenirs, and a handful of high-end post-security boutiques. Whether you forgot a date night outfit or you’re looking for gifts that don’t scream, “last-minute airport buy,” the Cartier storefront, Hermes store, Coach shop, and Salvatore Ferragamo shop are all worthwhile diversions. Terminal 1 is also home to stores carrying fresh flowers, Duty Free, and a Tumi for those in search of new travel gear. For relaxing: If you find yourself spending a layover in JFK’s Terminal 1, consider relaxing at one of the two XpresSpa locations. Come here for a pre-flight facial or post-vacation hand and arm massage to improve circulation. Locations to charge electronics: There are a number of areas in Terminal 1 where travelers can plug in: a charging station in the Welcome Center, outlets post-security at Gates 5, 7, and 8, and a pre-security Internet cafe that also offers web access and SIM cards. Complimentary Wi-Fi, provided by Boingo, is also available throughout the airport. Lounges: Terminal 1 is home to an Air France lounge, a Lufthansa Lounge, a Korean Airlines Lounge, and an Alitalia Lounge. Generally speaking, travelers must be flying with a First or Business Class ticket to access these lounges, though there are more than a few ways to get in without splurging on a top-tier ticket. The Air France lounge permits Premium Economy travelers who are willing to pay $50 for a day rate. Ritz-Carlton Rewards Credit Card holders can also get access to the Air France and KAL Business Class Lounge. Travelers with status in the airlines’ respective membership programs (Star Gold Cardholders for Lufthansa; Flying Blue Gold, Platinum, Silver, and Ivory for Air France) may also be able to get free access to the airlines’ respective lounges, though regulations vary wildly depending on the flight. Short-term parking options: Terminal 1 shares the Green Lot with Terminal 2, which is a daily parking lot. Visitors will be charged $4 for every half hour, with a 24-hour maximum of $35. Long-term parking options: Travelers looking for long-term JFK airport parking may want to opt instead for Lot 9, on Lefferts Boulevard. This option is accessible by AirTrain and charges $18 for the first 24 hours, with a $6 fee for every 8 hours. Terminal 1 was opened at 1998 under the direction of four key international airlines: Air France, Japan Airlines, Korean Air, and Lufthansa. Because of this, it is capable of accommodating giant Airbus A380s and remains a major hub for these carriers. Today, travelers flying with a variety of international airlines will use Terminal 1.
International Airlines: Aeroflot, Air France, Air Italy, Alitalia, Austrian Airlines, Azerbaijan Airlines, Brussels Airlines, Cayman Airways, China Eastern, EVA Air, Fly Jamaica Airways, Japan Airlines, Korean Air, Lufthansa, Norwegian Air, Philippine Airlines, Royal Air Maroc, Saudia (Saudi Arabian Airlines), TAME, and Turkish Airlines. Seeking the Delta terminal in JFK? JFK’s Terminal 2 is exclusively operated by Delta Air Lines, and has two levels: Arrivals and Departures. There are 11 boarding gates (C60 to C70), which are exclusively used for domestic destinations The airline operates its international schedule and most flights to and from San Francisco, Los Angles, and Seattle at Terminal 4. Fast Casual: Dining at JFK’s Terminal 2 is especially good, thanks to the contributions from a number of big-name chefs. After security, travelers can grab open-faced sandwiches from New York’s own chef Andrew Carmellini, or Shiso, by Morimoto chef Robby Cook. Yes, we really are recommending airport sushi. Sit-Down Dinner: Unwind before your flight at the BKLYN Beer Garden, which has an impressive selection of more than 20 beers on tap and a menu of standard American fare by chef Laurent Tourondel. You can also grab a seriously filling Italian dish from Due Amici, near Gate 62. Coffee Shops: For a caffeine boost in Terminal 2, head to World Bean (with locations available both pre-security and post-security). Don’t expect to do too much shopping at Terminal 2, which sells a few post-security gadgets (in case you left your headphones at home) and also has an outpost of Taste NY. The store sells hundreds of food and beverage souvenirs from local New York brands (think: Williamsburg-based Brooklyn Oenology wines), and is open 24 hours a day. Terminal 2 is also slim when it comes to activities to keep you pre-occupied before your flight, but those in search of locations to charge their mobile devices will find an option. Locations to charge electronics: There is one charging station at Terminal 2, which is located before security near the Welcome Center. Complimentary Wi-Fi, provided by Boingo, is available throughout the New York airport. At Terminal 2, the Delta Sky Club serves complimentary fresh food offerings, and has a complimentary bar for wine, beer, or a pre-flight cocktail. There’s even a business center equipped with printers and copiers, while the Club at Terminal 4 also has bathrooms with showers, so you can be totally ready for the day ahead. American Express Platinum cardholders, Delta One customers, and Delta Reserve Credit Card Members are among those that can access the lounge for free when flying with Delta. Short-term parking options: Terminal 2 shares the Green Lot with Terminal 1, which is a daily parking lot. Visitors will be charged $4 for every half hour, with a 24-hour maximum of $35. Only Delta utilizes Terminal 2, meaning travelers flying with other airlines won’t have post-security access to this part of JFK. Also known as the Worldport, JFK’s Terminal 3 was opened in May of 1960, and was primarily used by Pan American World Airways. It was slowly phased out of use and demolished in 2013. 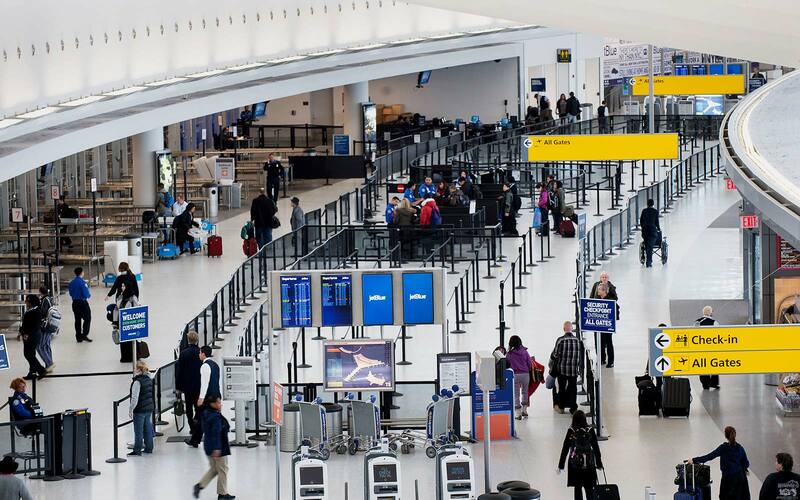 Considered by some to be the single-greatest terminal at JFK, it’s used by a wide number of both international as well as domestic airlines and has an impressive line-up of dining options. Fast Casual: Chef Danny Meyer has not one but three restaurants at JFK Terminal 4, including two post-security opportunities to sample his famed Shake Shack burger. A pared-down version of Meyer’s Blue Smoke barbecue joint is another prime option. Coffee Shops: Three Dunkin’ Donuts, three Peets Coffee & Tea locations, and a Flatiron Coffeehouse are just some examples of the many coffee shops in this New York airport. Bars: If you're looking for a cold beer before your flight, the terminal is home to the Tigin Irish Pub, which also serves food. While not a bar, those headed to Caviar House and Prunier can enjoy drink selections like wine with their caviar. Beauty brands are particularly prominent at Terminal 4, which has a sweeping Retail Hall and plenty of opportunities to stock up on duty free goods. Jo Malone, Hugo Boss, Kiehl’s, and the travel brand Tumi all have storefronts at this JFK terminal. There's also a branch of The Metropolitcan Musuem of Art Store for those looking to take an art-filled souvenir with them. For relaxing: A layover at Terminal 4 in JFK is best spent at one of the three XpresSpa locations (Gate A2, B24, and the west end of the Retail Hall). On the Departures level, this terminal notably has a pre-security interfaith chapel. Locations to charge eletronics: Charging your drained devices is easy at Terminal 4, which has charging stations in the Welcome Center as well as at all gates. 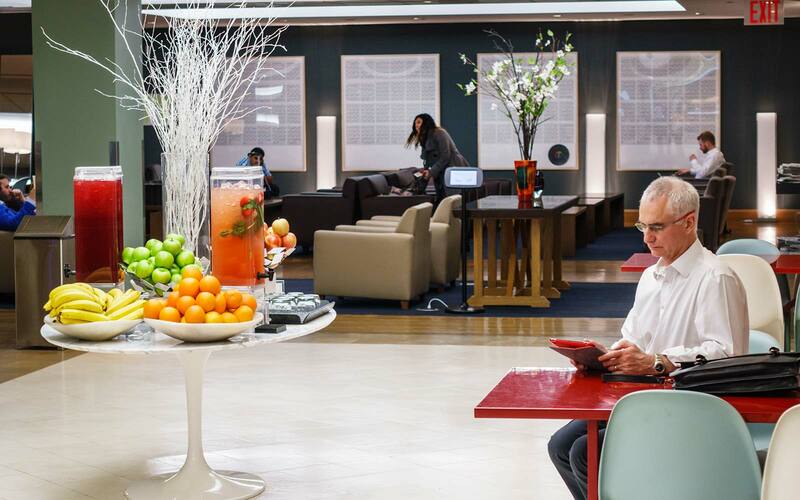 Lounges: JFK’s Terminal 4 is well-equipped to accommodate top-tier travelers before flights. Options here include an Air India Lounge (Gate A5), another Delta Sky Club Lounge (Gate B32), an El Al King David Lounge (on the fourth floor), an Etihad Lounge (on the fourth floor), a Swiss Lounge (on the fourth floor), an Emirates Lounge (Gate A5), and a Virgin Clubhouse (Gate A5). Travelers not flying with one of the aforementioned airlines can still enjoy the comfort of an airport lounge at Terminal 4’s Wingtips Lounge. For $50, travelers can receive access to the common-use lounge for up to four hours, with complimentary access to premium passengers on partner airlines (Singapore Airlines, China Southern, and Air Europa, for example) and network members who participate in programs such as Lounge Club and Priority Pass. Travelers utilizing Terminal 4 are encouraged to park in either the Blue or Yellow parking garages. Prices start at $5 per half hour, and may reach $39 during a 24-hour period. Some 30 airlines use Terminal 4 as their home base, including many regional international carriers like Air Serbia, Egyptair, and WestJet. International: Aeromexico, Air Europa, Air India, Air Serbia, Asiana, Avianca, Avianca Brasil, Caribbean Airlines, China Airlines, China Southern, Copa Airlines, EgyptAir, El Al, Emirates, Etihad, Kenya Airways, KLM Royal Dutch Airlines, Kuwait Airways, Singapore Airlines, South African Airways, Swiss, Uzbekistan Airlines, Virgin Atlantic, Volaris, WestJet, XiamenAir, and XL Airways. Domestic: Delta, JetBlue, and Sun Country. JetBluue's expanded Terminal 5 at JFK now has more than 30 food and beverage options, more than 30 shops, and 29 gates. Most of the gates here also come with touch screens to allow passengers to order food delivery straight to their gate. Sit-down Restaurants: Hailed by Eater as the “best sushi you will probably ever eat in an airport,” Deep Blue Sushi is one of the best options for a leisurely pre or post-flight meal at T5. Terminal 5 actually has a bevy of appealing sit-down restaurants. The Spanish-style tapas at Piquillo Tapas Bar are a great option if you’re raveling with a group, while the truffle fries at 5iveSteak are reason enough to grab a seat at the contemporary steakhouse. Sweets: You don’t need to have a sweet tooth to appreciate the dessert options at JFK’s Terminal 5. Here, travelers will find outposts of Dylan’s Candy Bar and the adorable bite-sized cupcakes from Baked by Melissa. There’s also a Ben & Jerry’s Scoop Shop, no less than four Dunkin’ Donuts, and a Horizon Bakery Café that sells masterful breads and baked goods. At the JetBlue terminal in JFK, travelers will find dozens of retail shops for last-minute needs or souvenirs. We especially love the MUJI To Go, which offers design-driven home goods and accessories with a minimalist, Japanese aesthetic, and the Benefit Cosmetics shop. Spend a layover at Terminal 5 in the BeRelax Spa, where you can be pampered with pedicures and manicures, an anti jet lag facial, table or chair massages, and oxygen and aromatherapy treatments to help you look refreshed after a full day of flying. Travelers have three excellent options for lounging at Terminal 5 — and none of them are hanging out at your gate. At the Moroso Lounge, travelers are perfectly positioned to watch plans takeoff and land. For a breath of fresh air, head to JFK’s only post-security outdoor space, the T5 Rooftop, while you wait for your flight. Terminal 5 shares the Blue and Yellow parking garages with Terminal 4. Prices start at $5 per half hour, and make reach $39 during a 24-hour period. All JetBlue departures are at Terminal 5, as this is the airline’s primary hub. Despite being the creation of renowned architect I.M. Pei, JFK’s Terminal 6 — also known as the Sundrome — the terminal was demolished in 2011. Currently operated by British Airways, JFK's Terminal 7 will also undergo changes as part of the new redevelopment. 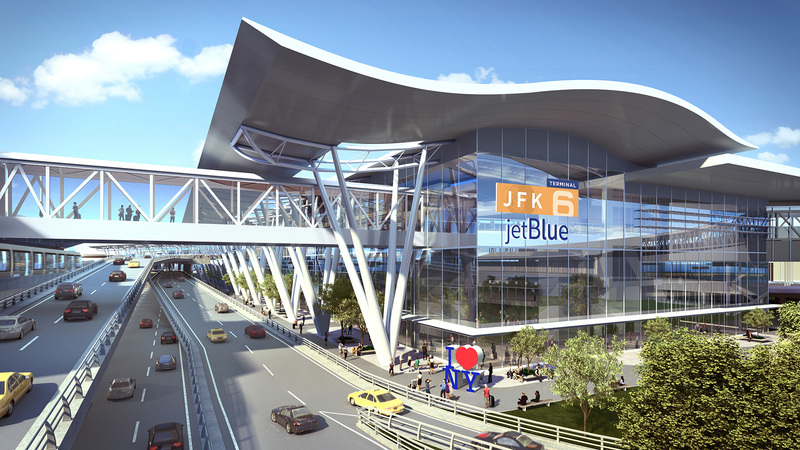 Construction plans include a new $3 billion and 1.2 million square-foot terminal by JetBlue that will be combined with the vacant Terminal 6, taking the place of Terminal 7 to create an international terminal complex connecting to its existing terminal at Terminal 5. 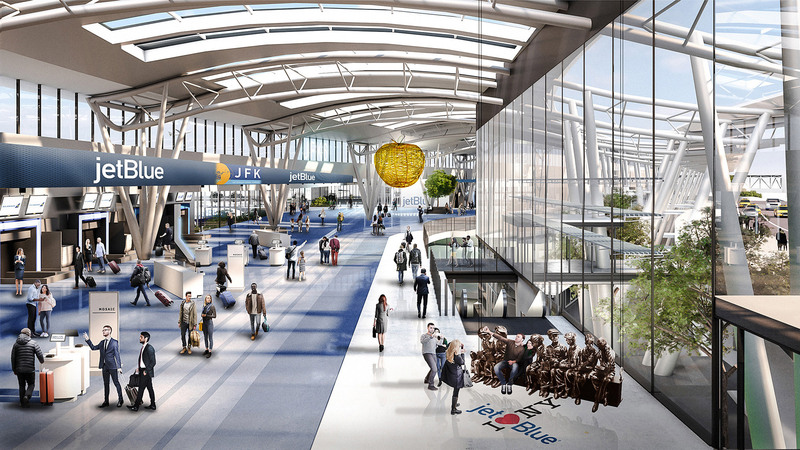 A rendering of the check-in area coming to Terminal 6 and Terminal 7. The new terminal will have 12 international gates, 15,000 square feet of recreational space, 30,000 square feet of airline lounges, and 74,000 square feet of retail. The first gates of the new terminal are expected to open in 2023, with completion planned for 2025. A rendering of the new Terminal 6. Today, the three-level terminal has an Arrivals floor, a Departures floor, and a Concourse level with boarding gates 1 to 12. Fast-food: Dining at Terminal 7 is limited, and your best bet will be the Wolfgang Puck Express, for a sandwich. Bars: If you want a drink, grab a seat at the Thirsty Beer & Wine Bar at Gates 6 and 7, or the Trafalgar Pub near Gate 10. 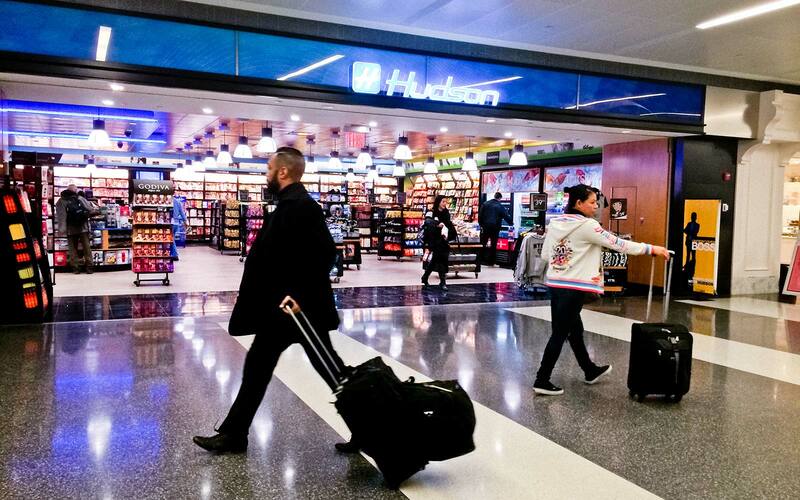 At Terminal 7, travelers will find the standard array of retail options, including a Duty Free shop, multiple Hudson News storefronts, and Best Buy kiosks for last-minute tech need. For more serious shopping, there’s a Juicy Couture, a Mont Blanc, and an M&Ms Store for fun, last-minute gifts (they don’t have to know you didn’t get it at Times Square). For relaxing: One XpresSpa location in the Terminal 7 Retail Hall lets travelers enjoy pre and post-flight services such as facials, massages, and nail treatments. Locations to charge electronics: Recharge at one of Terminal 7’s numerous charging stations, which can be found in the Arrivals hall, at the Welcome Center past the Arrivals center, and at Gates 6, 7, 8, 11, and 12. JFK’s Terminal 7 has a single lounge, the Concorde Lounge, which is located near Gate 1. The incredibly elegant lounge, which has a champagne bar and a full-service dining room with private booths, is accessible to British Airways travelers flying First Class. The lounge is also open to gold members of the airlines' Executive Club or an Emerald member of any of the oneworld airline frequent flyer programs. Travelers using Terminal 7 are encouraged to use the Orange-parking garage. Visitors will be charged $4 for every half hour, with a 24-hour maximum of $35. In addition to British Airways, a number of other international airlines make use of Terminal 7.
International: Aerolineas Argentinas, All Nippon Airways, British Airways, Eurowings, Iberia, Icelandair, Interjet, LOT Polish Airlines, Qatar Airways, and Ukraine International Airlines. Already twice the size of Madison Square Garden, JFK's Terminal 8 will soon be home to an additional 70,400 square feet of space thanks to a $344 million investment from American Airlines and British Airways to expand and improve customer experience facilities at the terminal as British Airways eventually moves to the location. As part of the new investment, 33,000 square feet of the space that will be added will consist of public areas, while another 57,500 square feet will be refurbished to add amenities like premium lounges for both airlines, enhanced baggage systems, updated check-in spaces, and upgraded concessions. Five wide-body gates will also be added to allow for more transatlantic flights as British Airways works to moves its operations to the terminal by 2022. At the moment, the terminal has two concourses and a total of 29 gates. Sit-down Restaurants: Grab a table at the Vino Volo Wine Room, near Gate 39, for a wine flight and a cheese plate. Otherwise, sit down for a meal at Bobby Van’s Steakhouse, or try a different wine selection and cheese plate at Cascata. Fast Food: McDonald’s and Au Bon Pain are some quick options available. The best grab-and-go sandwich is at Brooklyn National Deli, which serves solid pastrami sandwiches for a final bite of New York City. If you loved a glass of wine at Vino Volo, take one home with you (or enjoy it on your first day of vacation) from the Vino Volo Wine Shop, post-security near the food court. Other highlights from the Terminal 8 retail shops are the Solstice Sunglass Boutique, a Pandora, a L’Occitane, Brooks Brothers, and a Brookstone. Diversions for a layover in Terminal 8 are fairly limited, so you’ll want to kill time browsing the new releases at Hudson Booksellers, or perusing the Metropolitan Museum of Art Shop. Locations to charge electronics: One central charging station can be found pre-security by the Welcome Center. Complimentary Wi-Fi is available, courtesy of Boingo, through JFK. American Airlines' answer to the airport lounge, the Admirals Club, is avaiable to travelers flying First or Business class. Entrance to the Admirals Club is also available to travelers with AAdvantage status or a club membership. Certain credit cards (like the Citi AAdvantage Executive World Elite MasterCard) can also help you check out the lounges at American Airlines’ JFK terminal. Travelers using Terminal 8 are encouraged to use the Red parking garage. Visitors will be charged $4 for every half hour, with a 24-hour maximum of $35. Currently, there are no hotels inside of the airport, though there are several options nearby that include a Comfort Inn and Suites in Ozone Park, a Crowne Plaza in Jamaica, a Days Inn and Suites in Ozone Park, and a Radisson Hotel in Jamaica. Visitors coming in and out of JFK will soon be able to check into the upcoming TWA Hotel, which will be JFK’s only on-airport and AirTrain accessible hotel. The new hotel, which will open in early 2019, will restore the 1960's Eero Saarinen designed Trans World Airlines (TWA) Flight Center, which became famous for its architecture and offerings. Though the terminal has sat abandoned for years, it will now be brought back to life in a new hotel design that will include 512 guestrooms with views of the airport’s runways, six different restaurants, eight bars, and a museum that will be dedicated to hosting emblems of the jet age. The hotel is already taking reservations for those interested in a stay.